And we’re off! This was taken just off Byron Bay. My bedroom/office. The bathroom’s just next to my desk, and my 3DS charger (just) passed the cable safety test, so everything’s swell. In some ways I’m writing this blog in a familiar environment — tapping away on my work laptop on a sturdy desk, in a padded chair, music playing, WiFi-enabled. And, in other ways, it’s all topsy-turvy. Most notably, my office is heaving to-and-fro almost insensibly, rising up and over gentle hills of waves, falling down the other side, and up again. (My office/bedroom is right at the waterline, then below, then above, then below, ad nauseam). For this reason, I’m working from a clever non-slip tabletop, and where my chair has no wheels, it has a chain that hooks into the floor. Just beyond the sound of my music is the pouring, spraying of water slapping the hull of the ship, at my window. When we’re navigating slowly, it sounds like water being drizzled over hair and ears, when we’re at cruising speed, as we are now, it sounds like waves crashing over sand, then hissing with the spray. I’m on the Marine National Facility (MNF) research vessel Investigator, and for the next fortnight I’ll be your eyes and ears, your salt-filled nostrils and mouth-puckering stomach quiver as we voyage from Sydney, up the northern coastline past the Great Barrier Reef, around Cape York, and across the Gulf of Carpentaria to Broome. Along the way you can expect whales migrating in majestic pods, corals fluorescing in glowing cities, and flying fish gliding in breezy…swarms? shoals? flocks?, and not to mention some world-class science. What type of science? Cue heading two. This is a transit voyage, which means our main objective is to drive the ship across the country to start a research voyage from Broome. But of course, what’s an ocean trip without a bit of company? So we’re giving a lift to some mighty fine science. And what eclectic science it is. We’ve got: biology and ecology, geoscience, hydrochemistry, atmospheric science, education, and even a little military history. View of the foredeck and foremast from Deck 4. Off to the left was the Port Macquarie coast, blanketed by coloured storm clouds that gave way to rays of sun lighting up golden patches on the ocean. Three terns flew overhead, while drawing, which were drawn less than satisfactorily. Pen ran out drawing the right half. We’ve got two STEM teachers on board, geared to enliven their classrooms with real marine science (live-crosses will be staples); we’ve got a researcher conducting a survey on science communication; we’ve got an ornithologist on-board, binoculars in-hand, perched on the ‘monkey bridge’, a small lookout room high up on deck seven that cops the brunt of the ship’s movements – the closest you can get to being a camera on the end of a selfie stick; we’ve got sediment sampling to analyse Australia’s submerged real estate, weighing up its stability for renewable floating infrastructure, or its durability against tsunamis; we’ve got our regular on-board crew who analyse all the classic oceanic goodies: water salinity, temperature, depth, the seafloor with equipment capable of analysing 200 metres below the seafloor getting a quite literal lay of the land. One of the main objects, however, is looking at oceanic iron fertilisation. Is the meaning of those words elusive? Read on. Dr Ben Arthur from the MNF bird watching on the monkey bridge, with a view of the atmospheric sampling foremast (next paragraph). You can escape to monkey island (the area behind me in this photo), however it’s complicated. Who desperately awaits monster dust storms? The marine food web, of course! Imagine a bottlenose dolphin galloping through the water after a large carnivorous fish escaping to leave its prey behind – a school of bait fish, which were, themselves feeding on clouds of phytoplankton. All of these animals are pinned on one entity – the phytoplankton, and whether or not it’s there. There’s a sure-fire way to stop plankton from growing and collapse this entire food web – and that’s to take away iron from the water, to make it anaemic. So, adding iron induces fertility and makes the oceanic food web boom or bust, but where do the oceans get their iron? From the land. Desert dust, bushfires, and even exhaust, are whisked away by winds from the land, delivering iron into the oceans, cascading plankton and fish blooms, dolphin booms, and flourishing food webs. 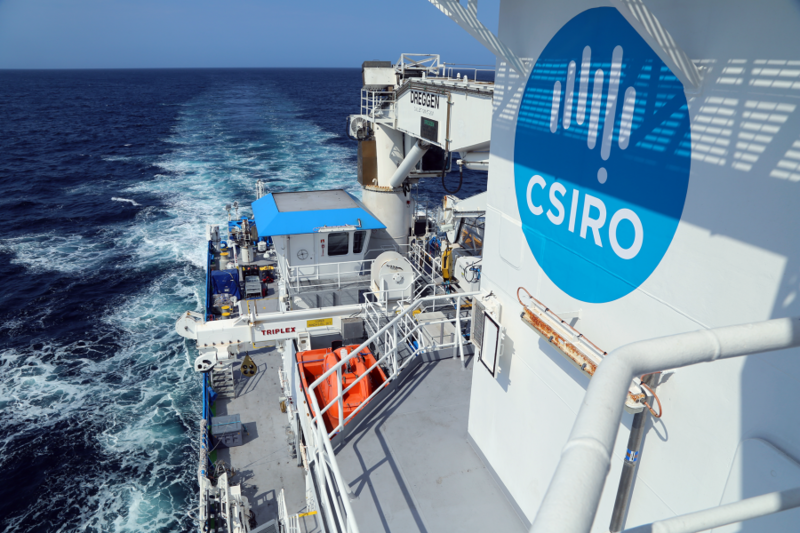 One research team aboard is using Investigator’s on-board sensors and specially fitted equipment to catch airborne particulate matter (containing iron and other nutrients) all the way from Sydney to Broome. 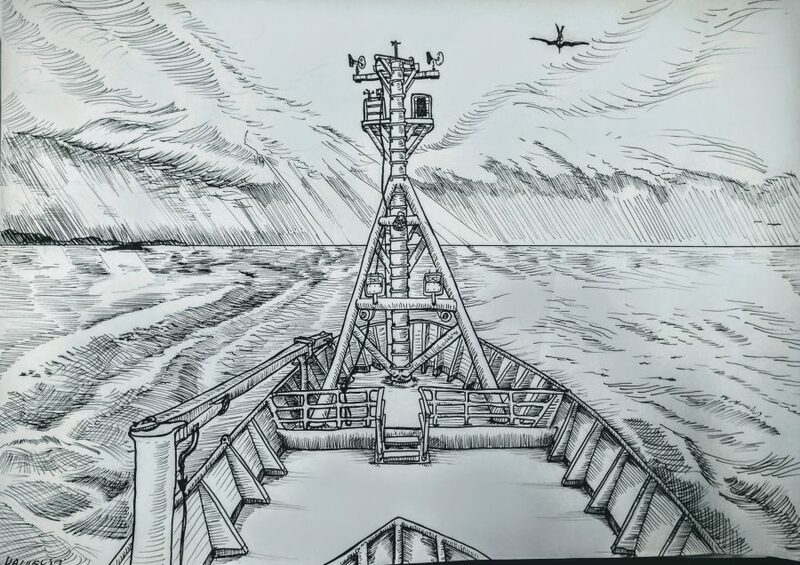 Investigator’s foremast is a snorkel, funnelling air particles down into the ship’s lungs, where they can be analysed in pristine clean labs on land. These data can then be matched up with weather events on land, like dust storms, to determine just how much the weather can stimulate ecosystem flourishes in the oceans. Insert cetacean. 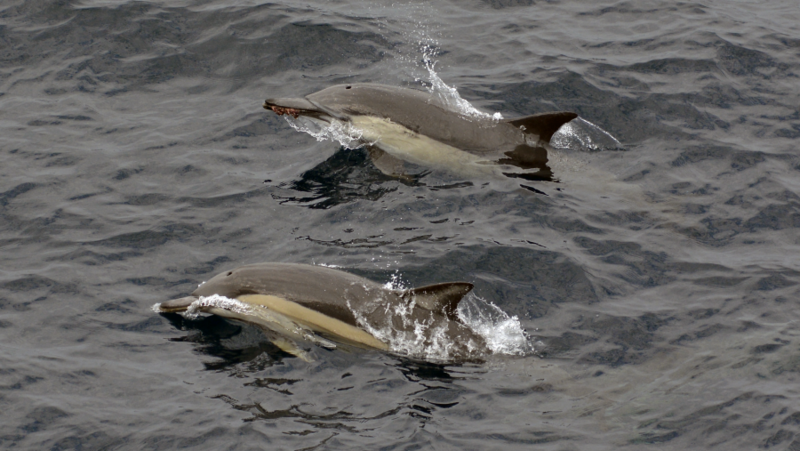 Here are two common dolphins (Delphinus delphis) that were skipping alongside our ship. Photo taken by Eric Woehler from the monkey bridge. The lucky dolphin further back has a hapless octopus crunched in its beak. 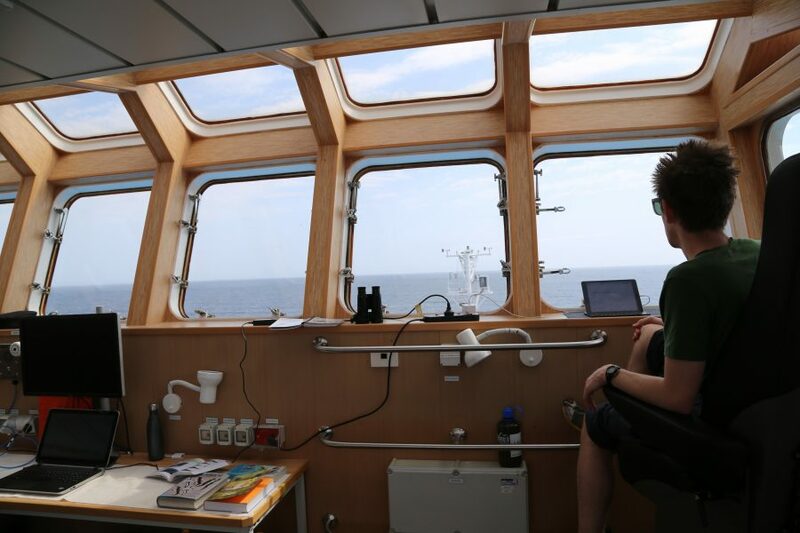 At the point of publication, already we’re on Day 2 of the voyage, and we’ve experienced a lot (bushfires off Newcastle, close to a hundred humpbacks, thousands of shearwaters), and have plenty to write on. Read blog number 2, right here. This is magic reading this and being able to zoom in and seethe octopus in the dolphins mouth. All kids should be excited by science. Good fortune of those stem teachers On board. 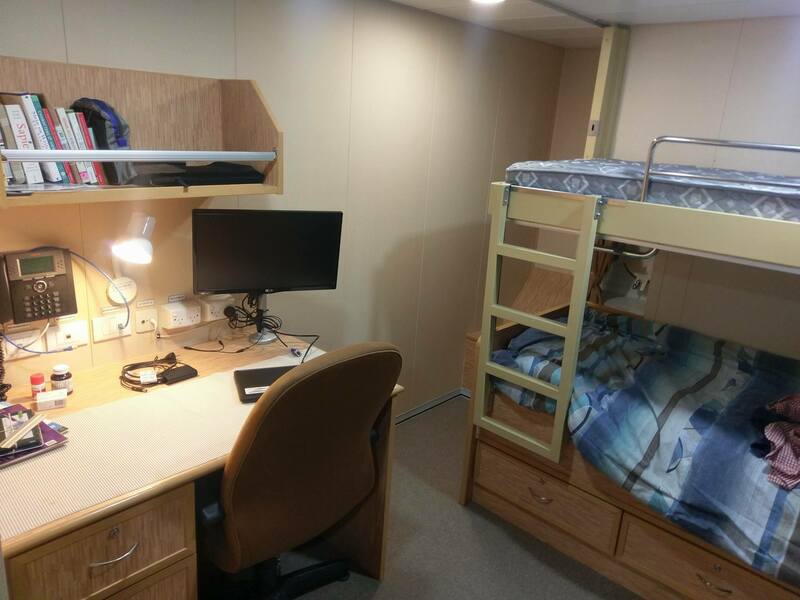 Great Blog Jesse, looking forward to more throughout the voyage!